Imagine sitting at your desk, driving a robot in another city, and having a high-quality video conversation with another person in that city. This past weekend we did just that, sitting in Charlotte, remotely controlling a BEAM robot in the Google Fiber Space in Kansas City, and having a conversation with the service manager. She even gave us a demo of Google TV through the connection. 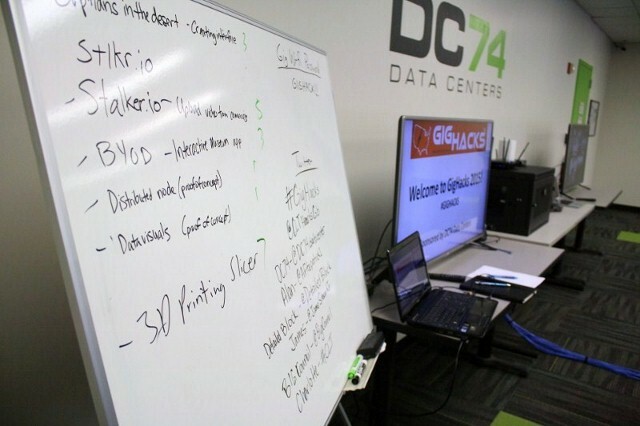 This was one of the highlights of this past weekend’s GigHacks event, hosted locally at DC74 Data Centers. 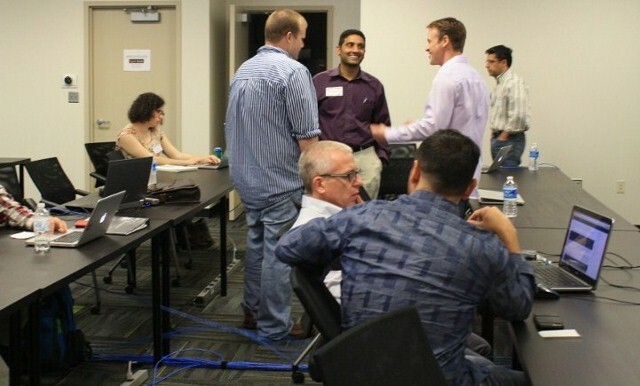 Held concurrently in San Francisco, Kansas City, Burlington, Chattanooga, and Charlotte, the three-day hackathon brought together gigabit-obsessed techies to see what Gigabit Internet can do. 294 people participated across the five cities. Some came to develop projects for new media experiences, move massive amounts of data, and create video streaming applications. Others came just to use a Gigabit connection first hand and see how fast it is. Thank you to our Charlotte GigHacks host and sponsor DC74 Data Centers. Software developers worked on Gigabit apps. On Friday night Lew Harford from the City of Charlotte spoke about the process used in attracting Google Fiber, and the support the city has for a Gigabit Internet infrastructure. Participants were able to ask questions about the process, including placement of Fiber Huts. James Stewart of Detailed Block facilitated the event, encouraging participants to pitch their ideas in front of the room. The remaining participants then joined the team leaders to work on apps. A few others stayed simply to try the Gigabit experience firsthand. Participants arrived early Saturday morning to work on the Gigabit connection. Simuloffice - an app that helps distributed teams work better. When users log into the app via the web or mobile device, they will see virtual offices with sets of teams working together. After choosing a team to work in, users receive a live continuous video feed. The volume of the video feed is dependent on what working team the user is nearest. Further away teams are quiet and closer teams are loudest. This enables the user to collaborate without intruding on current conversations and still hear discussions that may be useful to their work. Orphans in the Desert - a medical diagnostic tool where a doctor collects relevant medical data and then performs bulk remote computing for diagnostic information on incredibly rare disorders. The hack was set up to allow a doctor to input as many analytics on the person as possible, and then uploads to the IBM Watson platform to analyze it and provide a diagnosis. Four project teams presented to a panel of Charlotte judges: Pete Murphy CIO of Cardinal Innovations, Marianne Cotter Editor of Broadband Communications Magazine, and Jeff Thomas, Chair of the School of Business at Johnson and Wales University. The Charlotte winner....Simuloffice! Simuloffice took the Charlotte prize for best new Gigabit app. For a recap of the full GigHacks event from all five cities click here. Gigabit Internet is coming to Charlotte, and now is the time to prepare for how best to utilize the new infrastructure. Let us know if you would like to participate in the next GigHacks. And please subscribe to our monthly newsletter for updates and future Gigabit events.